Bulkhead collapse at Dutch Kills! First off, these are shots from my iPhone (which I had to use instead of the usual DSLR for a variety of reasons). Secondly, my intention yesterday was to just wander around LIC for a while while it was still foggy, set up the tripod here and there and get busy with the camera. Walking down 29th street (between 47th avenue and 49th/Hunters Point Avenue), you’re able to spy the turning basin of the Dutch Kills tributary of Newtown Creek, and this is part of my regular route around the area. When I got to 29th street, however, I found this scene. Sometime between last Saturday and yesterday (Wednesday the 12th) a not insignificant stretch of the bulk head collapsed into the water. 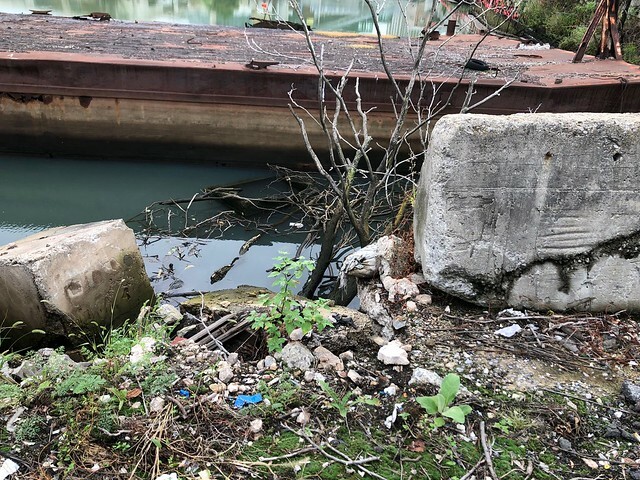 Those trees used to be at street level, and from the look of it, when the debris fell in the water it displaced a long abandoned fuel barge from the spot it’s been in for a decade or two. The barge is now riding up against an adjacent building on one side, and a second sunken fuel barge on another. It’s been pushed several yards from its former resting place, in the direction of the center of the channel. 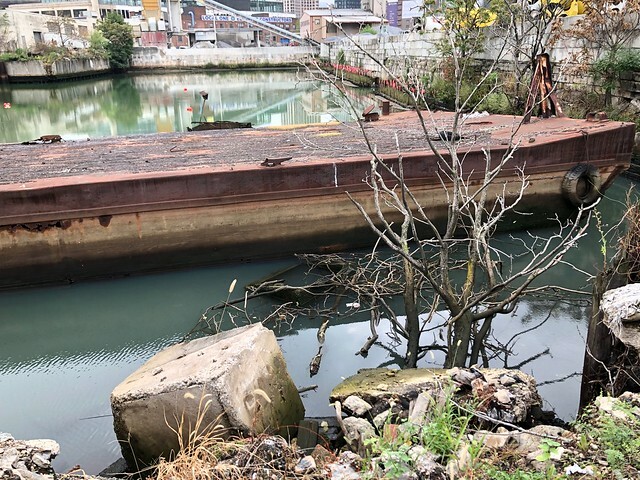 As a note, this is the second bulk head collapse on the Queens side of the Newtown Creek watershed in recent years, with the other occurring not too far away at the Vernon Avenue Street end. Disturbing portent, no? 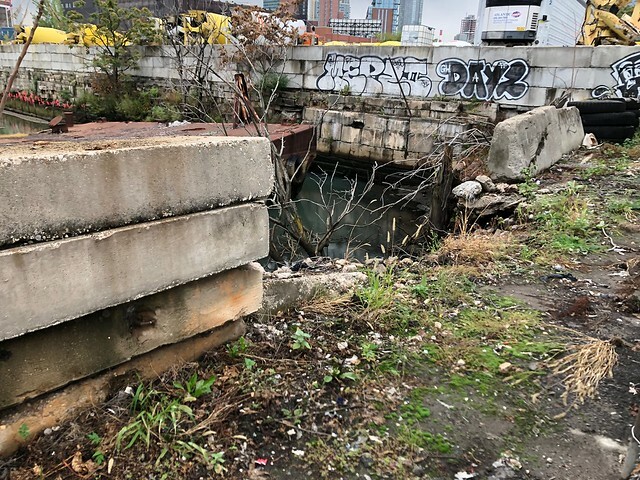 As is my habit, when encountering some profound alteration to the Newtown Creek watershed, I rang up my colleague Willis Elkins from Newtown Creek Alliance. He happened to be nearby, and we both puzzled over who to speak to about this situation. Two pronged, we decided, and got busy with the photos. Willis reached out to a few contacts whom he knew had regency over the spot (29th street is not a NYC street at all, it’s in fact a “railroad access road” owned by the LIRR) and I contacted Jimmy Van Bramer’s office, hoping they might be able to figure out what to do about this. Saying that, I’m a bit concerned about hydrological undermining on 29th street now, which a lot of very heavy trucks use regularly. Disturbing subsidences indeed.